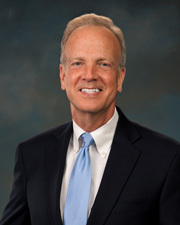 MORAN, Jerry, a Senator and a Representative from Kansas; born in Great Bend, Barton County, Kans., May 29, 1954; attended Plainville High School, Plainville, Kans. ; graduated University of Kansas, Lawrence, Kans., B.S., 1976; graduated Kansas University School of Law, Lawrence, Kans., J.D., 1981; M.B.A. candidate, Fort Hays State University, Hays, Kans. ; bank officer; instructor, Fort Hays State University, Hays, Kans. ; member of the Kansas state senate 1989-1997, serving as vice president 1993-1995, majority leader 1995-1997; Kansas state special assistant attorney general 1982-1985; deputy attorney, Rooks County, Kans. 1987-1995; University of Kansas School of Law, Lawrence, Kans., board of governors, serving as vice president 1993-1994, and as president 1994-1995; board of directors, Kansas chamber of commerce and industry 1996-1997; elected as a Republican to the One Hundred Fifth Congress and to the six succeeding Congresses (January 3, 1997-January 3, 2011); was not a candidate for reelection to the House of Representatives but was elected as a Republican to the United States Senate in 2010; reelected in 2016 for the term ending January 3, 2023; chair, National Republican Senatorial Committee (2012-2014).